One day before the departure date i.e 27th (Sunday) afternoon I got my girly problem. My whole trip was planned and we were spending two days for Tirupati Darshan and all other temples there. One day for Sripuram Golden Temple (Vellore), Kamakshi Amman Temple (Kanchipuram), Kanipakam Vinayaka Temple or Sri Varasiddhi Vinayaka Swamy Temple in Chittor. The holy trip for 29th, 30th and 31st December was fully planned. I called my doctor and she helped me out with the right medicine. Great ! I was very happy. God helped me in altering my destiny so that I could meet him. I strongly feel from inside that if you want something intensely even God gives you what you want because you cannot take “NO” for an answer. I had a feeling that the year 2016 will be quite different and I could sense that it was, in fact, going to be different from the way things had started gearing up from December end 2015. We boarded the train Tamil Nadu Express and reached Gudur. We got very friendly co-passengers one uncle and his son who were also going to Tirupati. They had planned their trip beforehand but could not go because of flood and rains in the south. We all reached Gudur. Our train was late and all of us boarded another connecting train from Gudur to Tirupati. We all travelled together. God gave us company for Tirupati, that is how I predict it. The connecting train was late. Our scheduled darshan time for Balaji Darshan was 1 PM on 29th December 2015 and room check in time was 12 Noon. We reached Tirumala hills by 2 PM. My husband checked for the room but it was cancelled since we were late. Since the room was booked online no one was ready to help or listen. My husband lost his cool. I asked him to check for all possible options. He said the only option was to do deposit the luggage in the cloakroom, do the darshan, get down to Tirupati and get a room there. I said fine if this is what God wants, it's Ok, let's do it. We had our lunch and stood in the line for Balaji Darshan at 3 PM. We completed our darshan by 6:15 PM in the evening. I was at peace after darshan and so was everyone. I and my husband gave hairs in Kalyan Katta. This is how I planned it. But here also, there was a twist. After we completed our darshan my husband told that now we cannot give our hairs since it has to be done before darshan. I told to just check once. He was very reluctant to do that. We got our luggage, phones and slippers. He checked his phone which had a missed call from his friend. He called back and his friend confirmed that we can give hairs after darshan also and we do not require entry tickets for that. We both went ahead and gave our hairs. Even God wanted me to go ahead and get what I wanted by helping me out. On 30th December 2015 we visited Sri Padmavathi Ammavari Temple, Sri Kalahasti, Sri Govindaraja Swamy Temple, Sri Kapileswara Swamy Temple and Iskcon temple. All day from morning till evening we did Puja and ate prasad. Great. It was a very different experience for me. It was a life which is not lived every day but only on some days. On 31st December, we had to visit Sripuram Golden Temple (Vellore), Kamakshi Amman Temple (Kanchipuram), Kanipakam Vinayaka Temple or Sri Varasiddhi Vinayaka Swamy Temple in Chittoor and then leave for Chennai from where we had to board the train for Nagpur. We visited Sri Varasiddhi Vinayaka Swamy Temple in Chittor in the morning. The idol of God Ganesha is growing in size every year was the centre of attraction for our whole family. You can see silver incarnations of lord Ganesha just at the entrance of the temple. We bought the entry tickets so that we could save some time for other temples. You can see a small Ganesha idol but deep inside, the part which is not visible, it is large. Great experience. I have a connection with lord Ganesha since my daughter Gauri was born on Ganesh Chaturthi. When everyone was celebrating and bringing lord Ganesha to their houses that is the time she planned to enter our world. We left for Sripuram Golden Temple (Vellore). The taxi driver gave us lots of warnings regarding lots of marketing in temple premises just for the sale of goods. But my experience was totally different. When I went there I could feel peace. We bought entry tickets for the temple. A guide approached us to guide us. He was so willing to be with us that we could not say a No. I feel God actually send him to explain everything about the temple. The Golden temple is so huge, vast and so well planned that you will not be able to take your eyes from any corner. It's really really beautiful. We walked all our way for Laxmi goddess darshan. 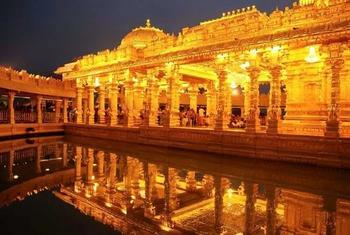 The temple and idol are made of pure gold. One our way the guide asked us to drop a coin of wish in the water which surrounds the main temple. That wish will grow and keep growing. That is something which really caught my attention. I really had to do a lot of brainstorming before I could wish anything. Because I knew I was here in this temple for a reason so I had to wish for some meaningful stuff, something which adds meaning to my life and to others life. I held the coin touching my forehead and dropped it in water. I knew in God’s hand all my wishes will be safe. After a few steps, we could see the idol of Goddess Laxmi. We sat there for a while. I was at peace there. My mind was totally blank. I was just seeing idol and was mesmerised with the whole environment and feeling. I don’t know who was sitting near me or what others were doing. I could just feel me and my God. That same feeling I got when I did Lord Balaji darshan at Tirumala. I was totally blank when I saw him and when I went out and touched the temple with my forehead, no emotions crossed my mind. I could feel something. A very divine feeling. I read all the quotations which were displayed outside the temple. One of them really caught my attention. It said without efforts you will not get anything. That was something which every human being had to understand that even Goddess Laxmi will not grant wealth if you put no efforts or actions to get it. We reached Kanchipuram at 3 PM and had to visit Kamakshi Amman Temple (Kanchipuram). Since the temple would open at 4 PM we went to Kanchi Kamakoti Peetham. The environment of math was very pleasing. There were so many quotations. I really love reading all quotations when given an opportunity. One of them said, “Even half or quarter of minute time with the guru will drive your ignorance away and grant you wisdom”. That quote really touched me. We met an uncle there and I was impressed by him. He explained us everything about the place and temples at Kanchipuram. He was a smart man in his late sixties with a passion for service. The Kamakshi Amman Temple (Kanchipuram) opened at 4 PM. We did our darshan and then left for Chennai. All the divine blessings and memories I gathered from the travel will help me in this year and the coming years to achieve my real purpose. The purpose for which I am born. I can feel 2016 as a turning point of my life. Full U-turn. I have shared my experiences of divine. I want you to know that God is with you all the time. God will help you if you need help, will leave you alone when you can handle things on your own, will alter your destiny if you want something very strongly. Go get your peace and achieve your goals. All the Best.